"View NW, towards buffer-stops; ex-North Eastern terminus of branch from Stanhope and Bishop Auckland. 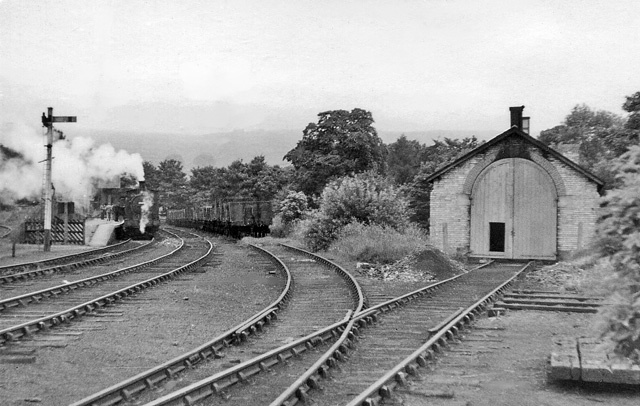 This was the Last Day of passenger services (27/6/53), but goods continued until 2/1/61 - to St John's Chapel until 1/11/65. The train in the station, waiting to make its last journey down Weardale is an ex-NE J21 0-6-0, which probably lived in the little Shed." Photo by Ben Brooksbank, 1953, and licensed for reuse under a Creative Commons Licence.